This photo was taken at our youth Christmas party last December...most kids are passionate about sports, music, fashion...not Taryn. I love Taryn! She is great! 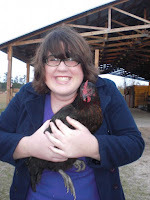 I think I was the next person to catch Henny Penny! Thank God for crazy people like me and Taryn who at least make people smile at our craziness!